A coming of age story from a new perspective. “Love Simon” follows a teenager named Simon who seemingly has the perfect life (read: huge house, car, hot parents) But life isn’t always as perfect as it appears on the surface. Simon happens to struggle with a big secret. He’s gay and hasn’t told anyone. He begins a penpal-like relationship with a fellow student named “Blue” who comes out anonymously on their school’s blog site and Simon becomes obsessed with figuring out who this mystery guy is as he begins to fall for him. A strong message about inclusion and representation in a mainstream Hollywood film. Sure there are small films like Brokeback Mountain and recent Oscar winner Call Me By Your Name that sometime breakout into the mainstream but they often are serious dramas with stories that end in either tragedy or heart break. 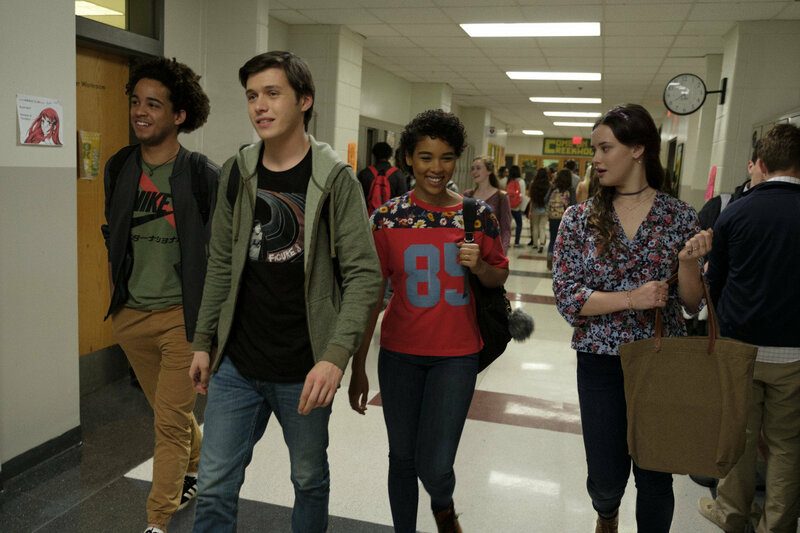 “Love, Simon” thankfully has no such ending. The film isn’t political whatsoever; there’s no agenda, that’s not the point. An impressive lead performance. All the performances here are truly great. However, Nick Robinson (somewhat channeling a young Matthew Broderick) who many probably recognize from “Jurassic World” gives a particularly impressive lead performance as the confused Simon. His struggles are palpable and the emotional roller coaster he invites us on is hard to forget. Moviedom’s nicest, coolest, and most understanding parents. Jennifer Garner and Josh Duhamel play power couple/Simon’s parents and even if they’re not necessarily given all that much to do they each have their moment to truly shine. After Simon’s coming out each parent has a really sweet moment with their teenage son. Bring tissues. The best friends. Thankfully the casting directors were able to find actors who actually looked, sounded, and acted like teenagers. Robinson is 22 sure but he looks young. Simon’s friends are all likable, appealing young actors and you feel like you’re watching real people. Of course the film isn’t afraid to have these people do unlikable things that have important effects on the plot which keeps things interesting. Nostalgia. Nostalgia. Nostalgia. Teen movies were a big deal back in the day thanks to John Hughes and all the other filmmakers inspired by him. All of those films are great, but you’d never see a gay character portrayed in such a non-stereotypical/offensive way let alone in a story from their perspective. 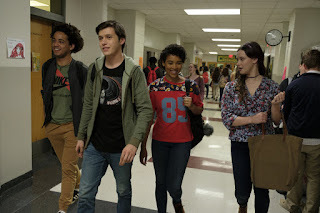 The film really feels more like the teen movie genre’s 90s counterpart that featured everything from “Clueless” to “Ten Things I Hate About You” and “Never Been Kissed” all the way up to the more recent “Easy A.” This one just so happens to be about a lead male character who isn’t into girls. Which is why anyone who was either a) ever a teenager or b) ever enjoyed movies about teenagers should find “Love, Simon” rather enjoyable. Teen movie cliches. Yes they exist. I’m talking about the goofy comic relief vice-principle (Tony Hale) who tries too hard to relate to his students (Natasha Rothwell). The pissed-off teacher who tells it like it is. And most ridiculous of all, the sheer amount of time that students in these movies have in the morning before class. Simon is able blow off breakfast with his already awake and showered family, pick up three of his friends, stop for iced coffee, find a parking space right in front of the building, and get to class on time. Right.